Trim asparagus stalks to 5- inch length. In boiling salted water, cook asparagus until tender, about 5 to 7 minutes. Rinse under cold water. Dry asparagus and roasted peppers thoroughly. While asparagus is cooking, place sundried tomatoes in boiling water for 10 minutes. Drain and finely chop. In a small bowl, mash together blue cheese, cream cheese and tomatoes. Spread each tortilla with about 1 1/2 tablespoons of cheese spread. Cut each tortilla into 4 long strips. 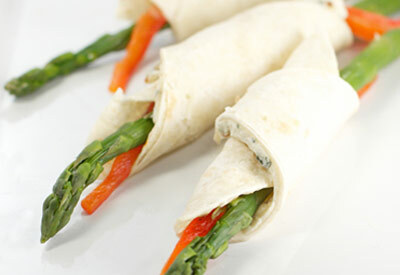 Place one asparagus tip and one pepper strip together at end of tortilla strip and roll up tightly into a spiral. Repeat with remaining asparagus and peppers. Serve immediately or refrigerate up to a day before serving. Place under broiler or over grill, turning every few minutes until skin is blackened on all sides. Place in paper bag and close tightly for 15 minutes. Remove peppers from bag when cool. Peel, split lenghwise and remove seeds and core. Do not rinse under water.